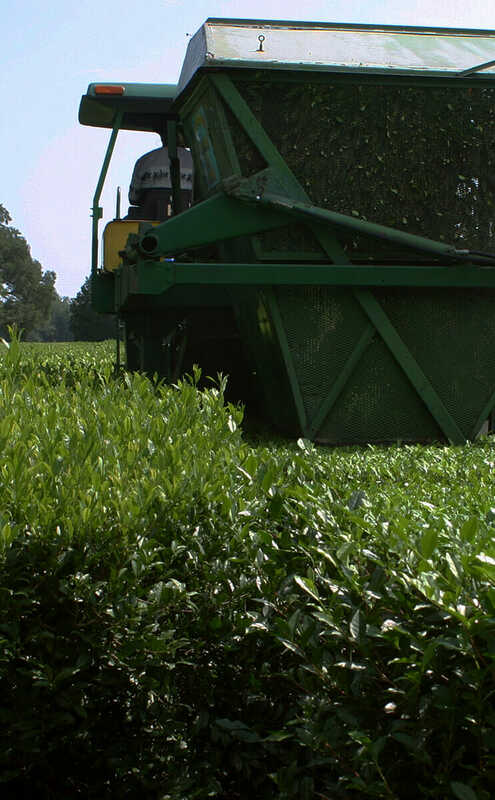 At the Charleston Tea Plantation, you can buy some of the only tea grown in America -- and gathered using a one-of-a-kind tea harvester. He worked his way into a tea-tasting apprenticeship in London for the world’s largest tea company, Brooke Bond, which included collectible wildlife cards with its teas. For four years he sampled and spat innumerable teas for little more than $5 a day. Surprisingly, the skill for tasting tea is harder won than that for tasting coffee or wine. Those two crops have but one harvest each year. Tea can have as many as ten between May and September. Each harvest (called a flush) may taste as different as that week’s sub-tropical weather. For a consistent flavor a tea taster might blend leaves from August with those from June. But as Hall says, “the first flush stands on its own.” In ancient times, the first tea harvested in spring was sold only to royalty. That first flush of new growth has a smoother and mellower flavor than tea harvested in summer. Typically, American consumers’ tea travels 5,000 to 10,000 miles before it plops into their teacup. Hall became a buyer of teas and spent his youth traveling between Argentina, Sri Lanka and Indonesia. He enjoyed the hospitality at a Sri Lankan plantation where they asked which tea they should serve him as they drew his morning bath. He opened an office in Argentina for one of the oldest tea companies in the world, Van Rees Tea. He opened his own trading company in 1975 and continued tasting, buying and blending the caffeinated leaves of Camellia sinensis, which he imported from all over the world. Typically, American consumers’ tea travels 5,000 to 10,000 miles before it plops into their teacup. But it doesn’t have to be that way. Also called Chinese camellia or tea camellia, this evergreen shrub is a cousin to the better-known caffeine-free, garden shrubs Camellia sasanqua and Camellia japonica. All three Asian camellias do well in the southeastern U.S. Because of the acidic soils, similar latitude and the warmth and humidity of the Gulf Stream, this quadrant of the country matches the climate of their native eastern Asia. For these reasons horticulturists consider the two areas to be sister regions: in the same way that human sisters can sometimes share pants, sister regions can often swap plants. Despite this, tea farming never took hold in the U.S., save a little-known experiment undertaken by one of the tea industry’s biggest names. Concerned about a possible world-wide tea shortage, Lipton Tea Company started a trial tea plantation the same year Hall began his apprenticeship. They chose the tiny Wadmalaw Island, outside of Charleston, SC, as the site. Lipton collected hundreds of camellia varieties from five previous 19th century tea growing attempts in South Carolina (three had failed due to the deaths of their proprietors: one from old age, one from a shooting, the third when his buggy flipped over while being pursued by bandits). Some of these varieties had naturally crossbred and their progeny were perfectly adapted to thriving in the Lowcountry. But Lipton never brought the tea to market. More than 20 years later, with a stable international market, the plantation became an afterthought. Lipton planned to plow the plantation under and replace it with a crop of houses. With his knowledge of the industry, Hall knew this would be a horrible mistake. So in 1987 he bought the plantation and set a goal to provide tea drinkers across the country with U.S.-grown tea for the first time in history. A portrait of Bill Barclay Hall, Charleston's Tea Plantation owner. The Green Giant shears off the harvest table of fresh tea leaves. 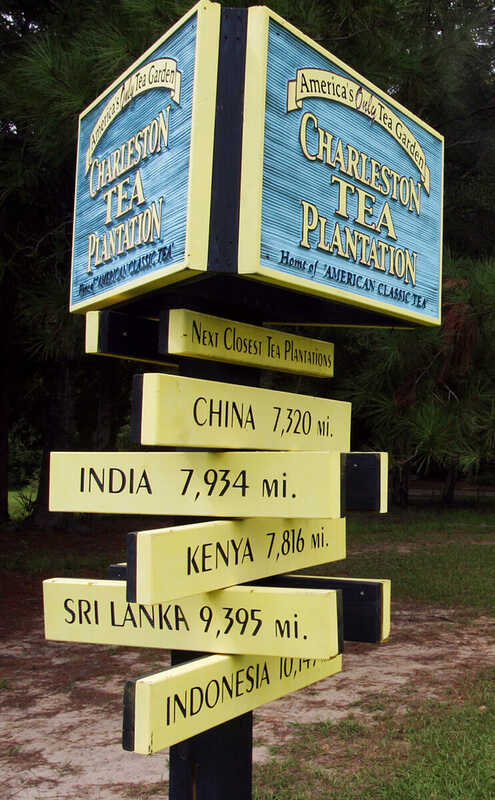 The next Closest Tea Plantation Sign. 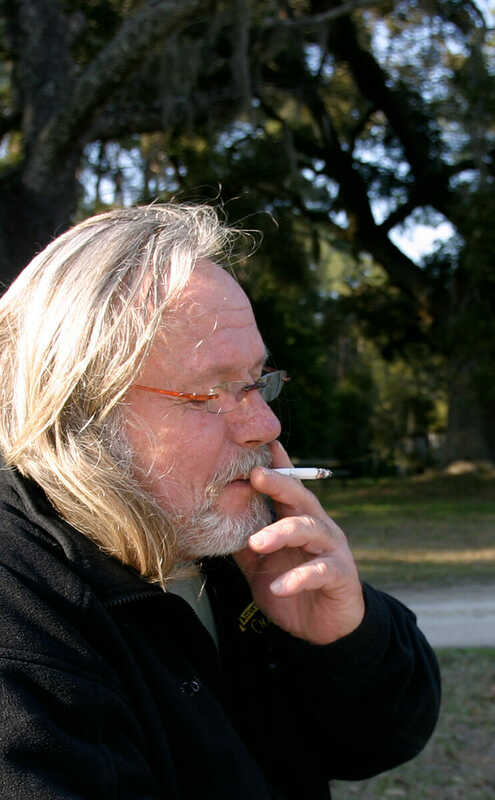 Hall transformed the research farm into a pesticide-free, low carbon footprint commercial operation called the Charleston Tea Plantation. There he acts as horticulturist and curator of his brand: American Classic Tea. It’s now the go-to tea at the White House and sold to specialty stores throughout the U.S. The driver in his tiny, open cockpit looks like he’s floating on a magic carpet over the fields. Beneath the driver, the chattering blades of a six-foot wide sickle bar – resembling the blades of a barber’s clippers – shaves a few inches of succulent new growth off the top of the camellias. Two big fans under the front of the tractor blast the feathery clippings backwards into a ten-foot long stainless steel chute. Like a roller coaster, the chute runs under the driver and up into the top of the bin at the back of the Green Giant. 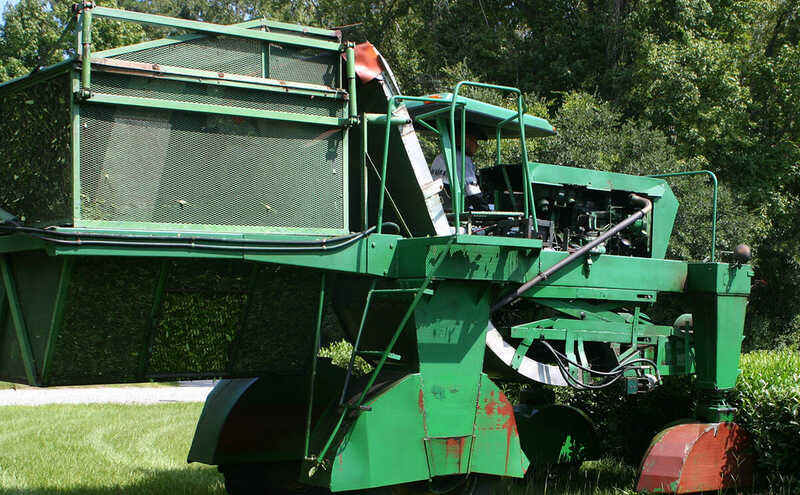 The chute expels nearly half a ton of clippings into the screened bin like so much jittery green confetti. Conversely, workers on traditional, mountainside tea plantations around the world harvest tea to the rhythmic snapping of hand-powered hedge-clippers. An open, narrow box bolted to one blade catches the airborne trimmings. When the box is full, the worker – holding their head cocked to one side–swings the clippers over their shoulder and dumps the fresh tea into a woven basket on their back. An outsider would be quick to suggest that these plantations should employ the Green Giant as well. But there is a simple reason they don’t. Since Hall’s plantation is on flat, coastal land it’s one of the few plantations suitable for harvest by tractor. But most tea plantations grow in hilly or mountainous terrain. Hall says a mountainside plantation the size of his might need 500-600 seasonal workers. Since Hall started American Classic Tea, a handful of mini-plantations of five acres or less have sprung up in the U.S. They are all either too hilly or too small to justify such a complex machine. Each load is enough to produce about 40,000 cups of tea. Visitors can watch the leaves get withered, shredded, oxidized, dried at 250 degrees and bagged. The Green Giant dumps clippings at the factory, which also resides on the island. Each load is enough to produce about 40,000 cups of tea. Visitors can watch the leaves get withered, shredded, oxidized, dried at 250 degrees and bagged. The clippings move along a series of sluggish conveyor belts. Cleverly, a strip of felt on one belt creates enough static electricity to extract twigs from the leaves as if it were a magnet. Like the factory the whole plantation is open to tours. Visitors ride around in two refurbished, wooden trolley cars. Hall drove one down from Philadelphia and the other – named Man O’War, after the race horse – from Kentucky. Recently Hall has capped his fifty years in the tea business by hosting weddings, reunions and corporate gatherings at the plantation. Every May there’s also a First Flush Festival of music, food and free, premium tea served in biodegradable cups. Frank Hyman is a former organic farmer with a BS in horticulture. He likes his tea iced and his tools quirky. He gardens in Durham, NC with his “strong farm wife,” a yellow lab and three chickens that live in a pagoda-roofed hen house. Learn more about Frank’s alternative garden practices on YouTube at LiberatedGardener.